This 40 S&W ammo made by Federal under their American Eagle line of ammo is great for target practice. 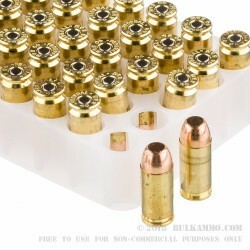 This ammo is one of the more common choices by US law enforcement for their range training ammo due to its consistency. This ammo features a 165 grain full metal jacket projectile with a flat nose profile common to the caliber. This ammo is brass-cased, boxer-primed, reloadable, and non-corrosive. It features non-magnetic traditional copper jacketed lead core projectiles that exit the muzzle at approximately 1,130 feet per second. Manufactured in Minnesota, Federal possesses a firearms collection that enthusiasts would drool over. They don't just let these firearms collect dust but rather they continually function test samples of ammo from each batch to ensure consistent functioning in a wide range of firearm platforms to ensure they're maintaining their edge. 300 rounds in with one defect. Ordered and received in very timely manner. Shoot about 300 rounds, no issues at all!!! Great ammo, great price & delivered to front door in 3 days. Good stuff, worth every penny. A: Approximately 36.5 pounds for 1000 rounds. A: Hello! 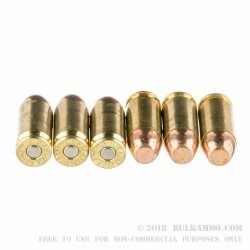 This ammunition is loaded with a standard copper jacketed, lead core projectile. Unfortunately due to the core of this ammunition being lead, you will not be able to use it at any range that requires lead free ammunition. Q: Are the rounds new or reloads? 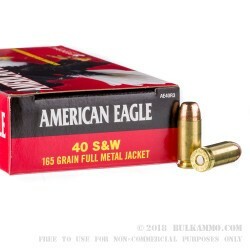 A: This American Eagle ammo is factory new. You may notice slight discoloration in the brass. These may be water stains left behind from the washing process of the brass. This will not harm the ammo or gun in any way. All components are new and do not contain any corrosive components.